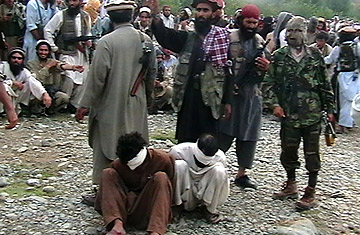 Pakistani Taliban militants prepare to execute two men accused of spying on behalf of the U.S. It's almost like a bad joke. A bus driver, a ski lift operator and a gym rat have turned the Islamic world's only nuclear-armed nation upside down. On Saturday Pakistani forces chased militants led by former bus driver Mangal Bagh from the fringes of Peshawar, a provincial capital 30 miles from the border with Afghanistan and a key transit point for vital supplies destined for U.S. and NATO forces fighting the Afghan insurgency. In Swat, a onetime tourist haven 100 miles from the capital, Islamabad, militants set five schoolgirls on fire, torched a primary school and burned down the country's only ski resort. Mullah Fazlullah, leader of the local Taliban chapter, used to work the chairlift. Last year he nearly brought the Pakistani military to its knees in brutal fighting that turned "little Switzerland" into something resembling Afghanistan before the fall of the Taliban in 2001. The government sued for peace. Fazlullah agreed, on the condition that he be able to implement Islamic law in the area. Meanwhile, in Waziristan, followers of Baitullah Mehsud, the physical trainer turned assassin, have slaughtered at least 22 peace negotiators who arrived on behalf of the government seeking to cement a cease-fire accord. Both the CIA and Pakistan's intelligence agencies say he is behind the attack that killed former Prime Minister Benazir Bhutto in December. Three years ago no one had even heard of these men. What happened? According to a new Pentagon report released on Friday, Taliban militants in Afghanistan have regrouped after their fall from power and "coalesced into a resilient insurgency." That resilience, according to military officials in Afghanistan, has a lot to do with their ability to find sanctuary in Pakistan's lawless tribal areas along the border. The day before the report's release, U.S. Defense Secretary Robert Gates said in a press briefing that he had "real concern" that Pakistan was contributing to Afghanistan's instability by failing to prevent militants from crossing into Afghanistan to carry out attacks on coalition forces. Cross-border attacks on U.S. troops in eastern Afghanistan have gone up 40% over the past several months. Gates attributes the increase to Pakistani cease-fire accords with Islamist militants in which the country's coalition government agreed to pull the military out of the militants' areas in exchange for a promise not to attack government institutions. The deals meant that "the pressure was taken off" the militants, who are now "free to be able to cross the border and create problems for us," Gates said. According to U.S. terrorism experts, the threat to the U.S. emanating from Pakistan's ungoverned tribal areas is comparable to the one it faced from Afghanistan on Sept. 11, 2001. Al-Qaeda "has hundreds of training camps" scattered throughout the region, says a Western official in Pakistan with access to some intelligence reports. "Most are less than an acre in size, so they are difficult to detect." But at the moment, Pakistan has little to no ability to tackle the problem. What it does have is a weak, fractured government whose sole focus is figuring out who is running the country. The parliamentary coalition that eclipsed the former military leader, Pervez Musharraf, spends most of its time in office wrangling over positions of power, neglecting the country's most pressing problems. Any long-term strategy on dealing with militants is being pushed aside. "It's like nobody is minding the store," fumes Shaukat Qadir, a retired brigadier. "If they don't start paying attention, we will be in trouble." At this point, the Pakistani government's lack of attention borders on negligence. For months militants have taken advantage of the Administration's distraction of consolidating forces around the strategic provincial capital of Peshawar. They have attacked freight trucks ferrying fuel, supplies and even helicopter parts from the southern seaport of Karachi to Afghanistan. The notorious Afghan warlord Gulbuddin Hekmatyar has seized on this weakness, exhorting militants in Pakistan to attack American interests there rather than fight across the border. "These days, the Afghan mujahedin have no need for you to come and fight in Afghanistan," he said in a statement obtained by the Afghan news agency Pajhwok. "But we do want you to fight Americans inside Pakistan." The supply convoys, he said, were being used to kill "innocent Afghans and civilians." In Karachi, long-distance truckers have been warned by a Taliban leaflet campaign threatening that "any trawler caught supplying diesel, petrol or goods" destined for foreign forces in Afghanistan "will not only be set on fire, but the driver will also be slaughtered." The offensive against Mangal Bagh marked the first major military response from the new Pakistani government against militants in the country. While the operation was nominally successful  Bagh and his men were driven from the area and his compound was blown up  it does not bode well for future anti-insurgent activities. Only one militant was killed, and within a few hours of the attack, Bagh was back on his pirate radio station vowing to continue his campaign for the imposition of Shari'a  that is, Islamic law. The lackluster performance of Pakistani security forces has raised eyebrows elsewhere in the region. Coalition-force officials in Afghanistan have noticed a distinct pattern with some of the more recent cross-border strikes. "The point of origin of the attacks [from Pakistan into Afghanistan] is routinely next to border posts of the Pakistani Frontier Corps," says an official with Western coalition forces in Afghanistan. "Either they are ignoring the fact that Taliban are fighting within their areas or they are complicit." Furthermore, details have emerged of deals involving Pakistani officials that specifically allow cross-border attacks in Afghanistan on the condition that those militants do not conduct any attacks in Pakistan. "People are kidding themselves in Pakistan if they think they can solve their insurgency problem by sending it across the border," says the military coalition official. "Any short-term gain has to be offset by the longer-term fact that anyone pursuing the fight across the border is not someone you want in your country."